Year 2000 was good, at least from a hunting perspective. A day before the season opened, we pulled back into the same campsite we were at four years prior, all smiles with fresh bull elk permits in our pockets for both my brother and me. But it would be all different this time. Opening morning presented the first taste of reality. Everything had frozen, you could walk on the creek, and each step on snow crunched through the entire forest. The Toyota's battery went deep into its knees, then barely made a start (this is significant because against Glenn's advice I had not purchased a new one, instead using the original, 4 ½ years old, and 80K miles later). On our way to the first hill to be explored three cow elk fled across the road. We would not see another elk until Sunday afternoon. Walking was of no use. Either the snow was crunching, or we announced ourselves by splashing through the PM mud. On Sunday afternoon Helmut and his wife Karin had decided to sit on a southern slope and wait because we had seen lots of elk tracks there the day before. Only a mule deer doe shared their company, bedding within 50 yards of them. I had chosen to simply walk through the cedar-covered slopes. The elk were there! But I only saw their fresh tracks, never even heard them as they noticed my approach, and moved off. All I got out of that exercise was a good case of getting lost while following their tracks and ultimately reaching a forest road with no clue where it led to. I hiked along it, for at least a mile, when it dropped off a mountain and allowed a far view across the treetops. I detected houses in the far distance and then knew that, naturally, I had to hike in the other direction to get back to the SUV. I made it back just before dark. Helmut had seen one elk on his way back, possibly a spike, but no chance of a shot because it was a 3-second encounter in thick cover. The snow with frost in the morning, and melting in the afternoon left us two options: wait for elk at more likely places such as south-facing slopes, or luck into one. In comparison, four years ago we had seen elk every day, and lots of them, everywhere. This was tougher. And the snow showed us that elk movement was slim to none where we had seen them virtually daily the last time. I realized that this might be a hunt when tags would not get filled. My criteria had been 'adjusted' down to taking any elk with horns. We decided for Monday morning to check the same country over that we had been in on Friday, even though there had been no new elk tracks along the roads since. As my sister-in-law confessed later, she was wondering why in hell I would even drive to this hill that morning, when a single bull suddenly fled along its base, through fairly dense old growth. Instant excitement! Helmut got out almost before the Toy stopped. And for whatever reason so did the elk stop (my theory is that the elk stopped because the crunching noise from the tires had quit, and he wanted to check out why). My brother took only a few steps to get past a tree, then assumed the kneeling position and fired. The elk moved on as if nothing had happened. Then he halted some thirty paces later. By then I had my combo ready, and got lucky with a hit to his big neck. 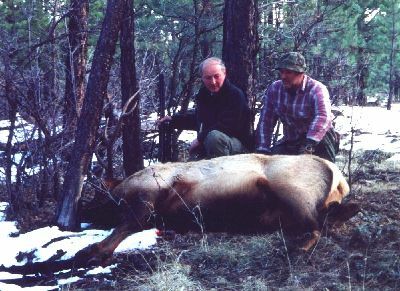 This of course was not too smart, because in all the excitement and desire to get meat in the freezer I shot what was basically my brother's elk. In fact he had hit the bull hard enough to force it to pause, but I had killed it. I tagged the 5x6, put my gun away as required by the reg's, and the work began. To our advantage was the experience gained four years ago, and we had come prepared. Building an Indian sled to drag this big boy to camp behind the 4Runner was easier this time. But still, gutting, construction and slow transport consumed all morning before he hung in camp. Karin took lots of pictures during the entire process, of course. 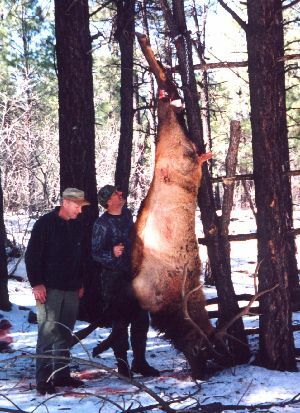 Rather than hike up the hill right behind camp, where three cow elk, including Dave's and Glenn's, had come to bag during our first ever elk hunt in this unit, we decided to sort of celebrate by driving into Pinetop to replenish some of our supplies. This killed most of the afternoon. On approach to our camp around 4 PM we traveled past "spike hill", so named by us after killing our spike elk there in '96. Since I had also seen elk there last year, I declared that I was just going to check real quick, and turned onto the road leading along its northern slope. I hadn't even gone 300 yards when I hit the brakes, because past some trees ahead, stood an elk, about 150 paces way. We did not need binoculars to see that it had antlers. Helmut got out, moved off to the right to get a clear shot with his drilling. Seconds ticked away, then the roar of the .30R Blaser. The elk did not flinch, but moved away slowly, slightly awkwardly. "He's hit", I whispered to Karin, as Helmut reloaded. Another bull moved right into the spot where Helmut's bull had just received the bullet. "Don't shoot! Don't shoot!" I yelled, afraid Helmut may not have seen this second boy approach as he recharged the rifle barrel. He didn't take another shot, and his bull halted after about 15 steps, shook, and went down. Hell of a Monday! We limited out. The work began anew, and well past dark we reached camp with this 5x5 in tow. We left him on the sled to cool well, since he was off the ground, celebrated a little after dinner and went to bed exhausted, but with really big smiles. What else is there to do when you luck into two nice bulls in one day? In our usual 'do it yourself' mode we spent all day Tuesday de-boning both critters, and cooking the meat off the skulls for transport to Germany. Wednesday was travel day, and with David's help (he came over after work), all meat was properly processed, and in the freezer by 10 p.m.
Now that all the hard work is done, Helmut, Karin and I often reflect on this great hunt on that lucky Monday, with nothing but smiles. Unforgettable! The elk had indeed moved, away from the timber and into the lower cedar regions with less snow. Hunting was really either a matter of getting lucky, as we did, or looking for signs, then being patient and waiting for them, as we had planned to do. Frozen or thawing snow is bad news because it prevents silent movement. It is good news because it still leaves tracks, and therefore at least reveals where the elk have been active. In comparison to the opening day of the 2000 deer season, I'd say it's easier to have hunting success in rainy conditions then to face old snow on an otherwise beautiful sunny day. Above all, never give up. For the first time on any elk hunt I was really concerned that we may not have success because we could not move without making loud noises. And as long as we did walk, we never saw game. In comparison, four years earlier we had actually passed up small bulls on the first two days of the season. I'll take good luck any time, but often wonder if our plan to wait for the elk at likely places would have also been successful. It helped to have been familiar with the area. It was the fifth time that I was hunting or helping to hunt elk here, and they seem to have their preferred travel corridors. While they may not follow a daily pattern, in the end we bagged our bulls where I had seen elk repeatedly over the years. If I ever get drawn here again, I know exactly where to set up two primitive ground blinds.